A crochet hook, sometimes referred to as a crochet needle, is the basic tool you'll need to get started on your crocheting journey. 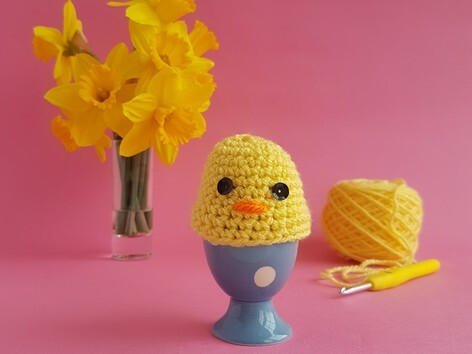 Made from metal, plastic or wood with a small hook at one end, crochet hooks are used to turn a lovely skein of yarn into cozy jumpers, snuggly blankets and beautiful home accessories. 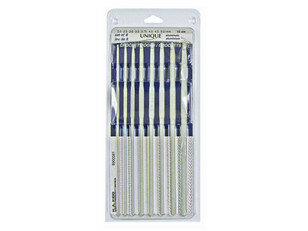 All crochet hooks have similar basic features, in the same way knitting needles do, but different brands may modify them slightly for extra comfort or a more eye-catching design. The point is the part at the very end of the crochet hook, and is also often known as the 'head'. It can either be smooth and rounded, or more pointed and well-defined for working with non-elastic yarns or closely-packed stitches. The throat of the crochet hook is either tapered and shallow, or sharp and steep. A steeply angled throat is known as “in line” and can be better for beginners as it helps to keep stitch sizes consistent. The tapered style on a crochet hook is less easy to control and over-tensioning can easily occur, as stitches are worked on and off the hook. 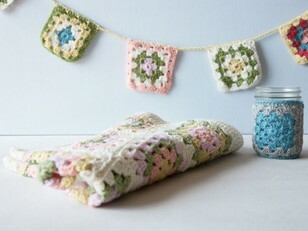 The shaft is the section of the crochet hook that is measured in millimetres to give the hook size, and is also the part that dictates the size of the stitch. Some hooks have longer shafts, which are useful for stitches that require multiple wraps, or where several stitches need to be worked at once. 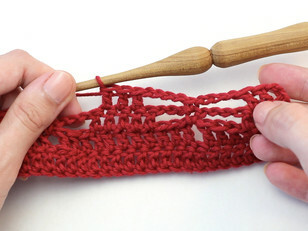 The thumb rest on a crochet hook is a flattened, wider section that makes it easier to hold and work with, and it's also the place where the size of the hook is often printed. 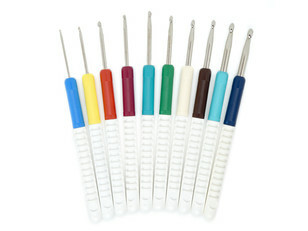 Many crochet hooks have a modified handle section made of grippy material such as rubber or plastic, sometimes ergonomically designed to be easy to hold. 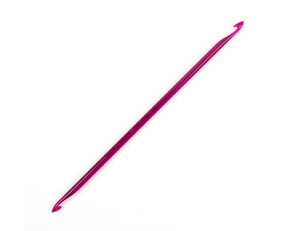 Crochet hooks are available in a huge range of shapes, sizes and materials - so there's a hook out there for every crocheter to get to grips with! 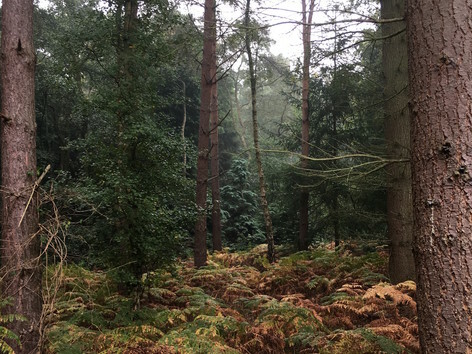 In the past they were made from bone, but these days they're more commonly made from steel, aluminium, wood, bamboo and plastic. 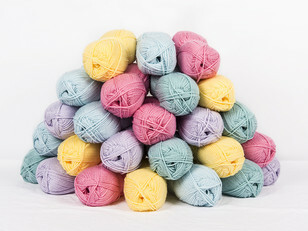 Choosing a crochet hook is similar to a knitter choosing needles - it's down to the preference of the crocheter, the demands of the project and the wool that is to be used. Very smooth yarns may be best worked with wooden or bamboo hooks, where the slightly rough surface helps to control the movement of the yarn. 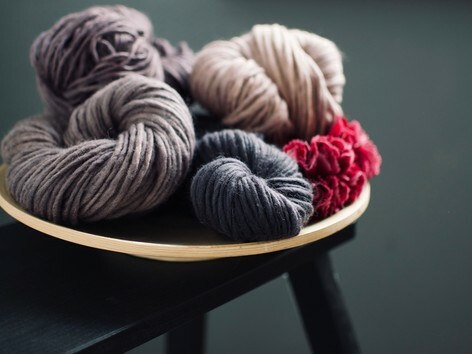 By contrast, a yarn such as mohair might be liable to snag repeatedly on a wooden or bamboo hook, so plastic or metal would be a better choice. 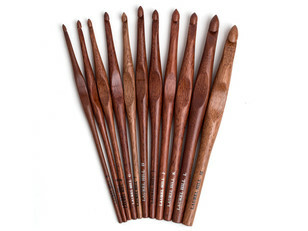 Wood, bamboo and bone crochet hooks are popular for their warm, natural feel, and for the way they help to control the yarn as it's worked. Aluminium hooks are light, strong, and practical. The smooth surface allows for easy manipulation and stitch making. 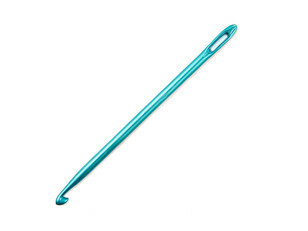 Steel is the strongest crochet hook material, and is used to make fine hooks for producing detailed work, such as crochet lace. 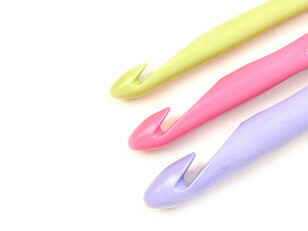 Plastic crochet hooks are budget-friendly and super practical. They come in a wide range of fun colors, are light and warm to use, and are fabulous for encouraging children to start exploring crochet. 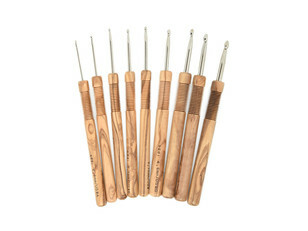 Some crochet hooks are made of a combination of materials. Very fine steel hooks can be hard to hold and work with, so many of these are now designed with ergonomic plastic or rubber handles. Tunisian crochet uses a different type of crochet hook, much like a knitting needle with a hook at one end. This method also stacks stitches along the long needle, working them on and off in rows as in knitting. Tunisian crochet hooks can be long and straight or they might have a flexible extension ending in a stopper to allow for the construction of very long rows and large flat pieces. 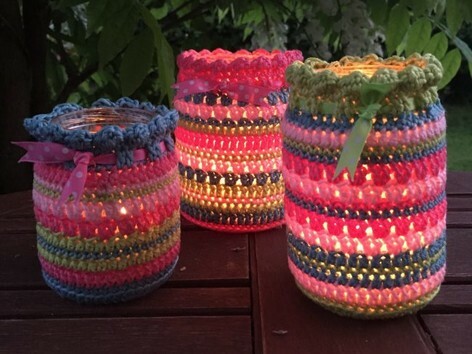 These make it possible to construct Tunisian-style crochet in the round, and means that large pieces can be produced with a fairly short tool. They look a bit like knitting needles, but have a hook at both ends. Knooking is a new combination technique, involving a long needle with a hook at one end and an eye at the other. The method uses the hook to pass stitches on and off a “lifeline” yarn. 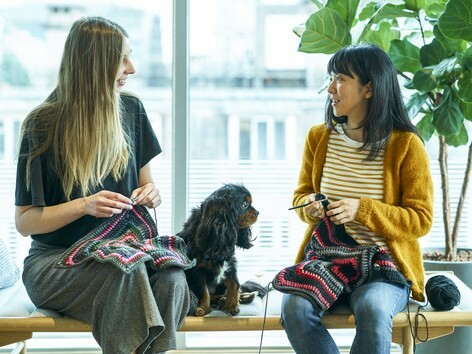 A knook creates a knitted fabric, appealing to crocheters who don’t like knitting with two needles. 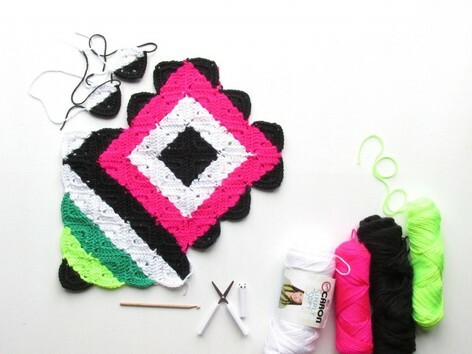 The history of crochet: Is it as old as the hills?